The Hyundai C3 Roll Top concept car. Hyundai's Veloster coupe is now also a ute! HYUNDAI'S Veloster hatchback has been transformed into a convertible ute. The South Korean brand has unveiled the C3 Roll Top concept - which stands for "Convertible 3-door" - which has a rolling canvas roof and a rear, ute-like tailgate rather than a boot. The concept retains the quirky hatchback's 2+1 door layout, with the canvas roof operating inside the roof-rails of the car. The fully automatic roof can be rolled all the way backwards for the full open-top experience, or rolled to the front of the car so the tiled rear section of the car can be used for stowing pushbikes - such as the one Hyundai has designed specifically for the concept car - as well as kayaks and the like. "The Veloster C3 Roll Top concept offers the 'no strings attached' freedom of a roll-top convertible and customisable utility," says Chris Chapman, Hyundai Design North America's chief designer. 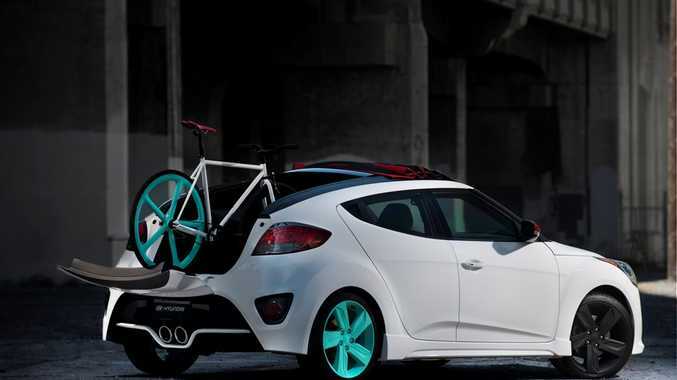 The C3 is based on the popular Hyundai Veloster SR Turbo, and sports the gaping air intake at the front and a slightly revised rear-end diffuser. It also gets funky double-colour 18-inch wheels to match the custom bike. Hyundai hasn't announced whether it plans to introduce a production version of the C3, but the brand did deny earlier this year that it had plans to offer a convertible version of the Veloster. Some other cars offer similar roll-back roof sections, including the Citroen DS3 Cabrio and the Fiat 500C - the latter of which has now been unveiled in Abarth trim.